Choosing Hockey colleges is a very difficult task. Your child comes to you and says "Mom and Dad, I want to play hockey in the NCAA." At first you are extremely happy then, it's amazing how the floodgates open with questions from one simple statement. "What hockey colleges should I research?" "What team should my child play for?" "What school should my child go to?" "How much will it cost?" "How will we pay for this?" "Can my child get a scholarship?" I can't believe how many things there are to consider when it comes to choosing hockey colleges. Then I settled down and started to look at things in term of getting ready for a hockey game. Things got a lot clearer and a lot easier. All kinds of questions came up. What hockey program does it offer? Is it Division 1 or Division 3? Does it offer a men's and women's program or is it men's only or women's only? How far is it from home? Can I drive home or will I need to fly? What incidental costs will I need to cover? How much will this be? What type of degrees does it offer? Are these the courses that I want to take? Is it a large school or a small school? What is the rink like? What is the locker room like? What training facilities do they have? What health facilities do they have? So settle back and start to look at the questions in terms of getting ready for a game or a season. When you plan your tournaments at the beginning of the season, you decide on how many local and how many away tournaments. Then, for the away tournaments, you decide whether you want to be within a reasonable driving or bus ride distance versus a plane trip. You can apply the same scenario to creating your list of schools and answer the question "Do I want to be within driving distance to get home or will Mom be Ok if she has to catch a flight to see me only once or twice a year?" In most cases, the closer you are to Mom, the better! When you are selecting your tournament, you always look at what type of competition you will face and then decide " Do we want a men's and women's tournament or men only or women only?" The same works for researching the hockey colleges. If you have a boy and a girl, you may want to look at programs that offer both men's and women's hockey. Think about when you walk into your favorite arena and all the great things about it. The smell of the fresh popcorn, your favorite spot in the locker room, the anticipation of stepping on the freshly flooded ice and hearing the roar of the crowd after you score the winning goal or stop a sniper on a breakaway. You can duplicate these fantastic feelings and emotions when evaluating hockey colleges. Book a visit to the school and get tickets for the game. Your team trainer is always on hand if your child gets hurt during the game and you are there if your child needs to be taken to a higher level of care. Now, the good old training staff and therapists will be on hand for game injuries, but if your child needs further care, there may be a good chance that you are not on hand. How close are the health facilities and what level of care can they provide on campus? Checking out how the Refs are calling a game has become a habit of mine before we start our game. It always helps when I have a sense of how the refs set the flow of the game. Are they calling everything or just letting things go? The refs would be like security at the school. Are they strict or do they work to provide solutions to keep things in order? How comfortable will you feel and how comfortable will your child feel with the security measures a particular school offers? When the refs are doing their job, you feel very good, same goes for security. Completing your pre-game routine gets you ready to bring your "A" game. 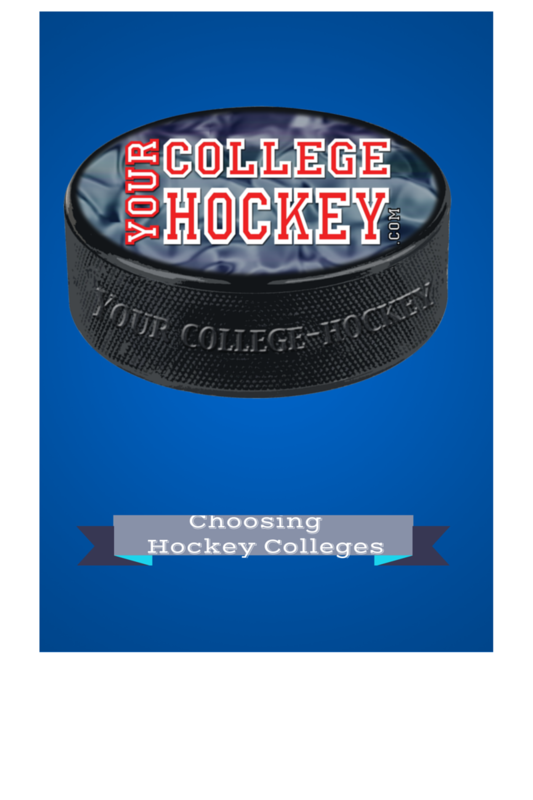 Do your research on choosing your hockey colleges with the resources in our site will help you bring your"A" game to to the next step in making the decision that is the right fit for you. You are almost ready for the game, next choosing the coach(es) and the team.